Between social groups there are boundaries, and these social structures are made tangible in the spaces and buildings that groups use. As Markus (Buildings and Power 1993: 13) observed the raison d’être of a building is to interface Visitors and Inhabitants and to exclude Strangers. This creates two different thresholds for the group who use the space; the boundary of separation from the Strangers and the boundary of transaction with the Inhabitants (who maybe non-physical). This is a projection of the fundamental body ‘container’ metaphor identified by Lakoff and Johnson (Metaphors we live by 1980: 29-30 and Philosophy in the flesh 1999: 32-36). How these thresholds are manifest in the architecture and used by the groups can be informative; what or who is or is not allowed across these thresholds reveals the groups confidence or fears of group contamination, the willingness to embrace the change that crossing these thresholds manifests, and how the powerful threshold is controlled. The ‘container’ metaphor is a major fundamental part of being, perceiving and ordering the world. Fore as they put it, “Our bodies are containers that take in air and nutrients and emit wastes. We constantly orient our bodies with respect to containers – rooms, beds, buildings. We spend an inordinate amount of time putting things in and taking things out of containers.” (Lakoff and Johnson 1999: 36) We have territorial behaviour because we see ourselves and everything else as territories. “We are physical beings, bounded and set off from the rest of the world by the surface of our skins, and we experience the rest of the world as outside us. Each of us is a container, with a bounding surface and an in-out orientation. We project our own in-out orientation onto other physical objects that are bounded by surfaces…..We even give solid objects this orientation, as when we break a rock to see what’s inside it.” (Lakoff and Johnson 1980: 29-30) They go on to say that the boundary can by fuzzy, such as the inexact vegetative edge of woodland. The container can also be a substance, such as being ‘in the rain’, which also has a fuzzy boundary. “Given that a bounded physical space is a CONTAINER and that our field of vision correlates with that bounded physical space, the metaphorical concept of VISUAL FIELDS ARE CONTAINERS emerges naturally.” Something is ‘within/out of our sight’. This extension of the container metaphor is mapped further on to events, activities and states. Thus when people are performing a ritual in a building, it is a coherence of multiple containers mapped from the primal bodily container; the visual field, the building, the group and the activity. Each reinforcing the other. Figure 1. A comparison of various published models for relations across thresholds (Lakoff and Johnson 1980 and 1999, Markus 1993, Hillier and Hanson 1984, Karakayali 2006, Tuan 1988 and 1986, Irvine, Hanks and Weddle 2012). “A container schema has the following structure: an inside, a boundary, and an outside. This is a gestalt structure, in the sense that the parts make no sense without the whole.” So each cannot exist without the other, and each generates the others. (Lakoff and Johnson 1999: 32) The container of a building likewise creates insiders, boundary people and outsiders; or inhabitants, visitors and strangers. In the introduction to “Buildings and Power” an extensive study of the new types of buildings that appeared in post-medieval Europe, Markus observed that the raison d’être of a building is to interface Visitors and Inhabitants and to exclude Strangers (1993: 13). Here and in the rest of this article I have italicise these three terms as they have a more specific meaning than that in general usage. This is to avoid confusion in such cases as when what are generally called ‘strangers’ are actually in this approach Visitors, because they visit the space/container/group, but they do not inhabit it. The Strangers are those that are kept outside of the group/space. The Inhabitants are those within the group/space. The Visitors are those allowed to cross between the two groups/spaces, but they do not fully belong on either side of the boundary. In the case of a building the Inhabitants do not necessarily need to be have to be physically inhabiting the group/space, so long as the Visitors have social knowledge about the Inhabitants of the group/space. “An inhabitant is, if not a permanent occupant of the cell, at least an individual whose social existence is mapped into the category of space within that cell: more an inhabitant of the social knowledge defined by the cell than of the cell itself.” (Hillier and Hanson 1984: 146). It became apparent while using the permeability mapping technique of Hillier and Hanson in my case studies of religious buildings (see Doorways to the Divine page) that the liminal nature of the role of the Visitors dominants these buildings more than other buildings due to the non-corporeal nature of the Inhabitants. When there were human inhabitants, such as monks or priests, these were accommodated in a separate branch of the building’s layout and were not the dominant influence, nor at the centre of the architecture. They were literally in a side line of the building. By contrast a royal residence’s lay out, with all the attendant ceremony, are orientated entirely around its physical human inhabitants. A monastery could therefore be seen as a court with Christ as the invisible king and the monks as courtiers. The Visitors are those that are permitted to pass between outside and inside of the group/space. By their movement they extend the container boundary, and separate out its two fundamental roles. Thus there are two different thresholds for the Visitors who use the space; the boundary of separation from the Strangers and the boundary of transaction with the Inhabitants. The Visitors experience the liminal. They encounter two thresholds, and move in to a space which is not wholly their own. The Visitor therefore has some of the qualities of both the Stranger and the Inhabitant. I refer to these as the Visitor-Stranger (V-S) threshold and the Inhabitant-Visitor (I-V) threshold. The liminal experience for the Visitor is there even when this is not a ritual space, but with a ritual space the liminal quality is even more relevant. So the experience of liminality in ritual is more far reaching than that observed by Victor Turner (1982). The theatre practitioner Clive Barker explored in theatres and theatre workshops the effect of the thresholds formed by stage sets, actors and furniture upon actor and audience, and saw these as fundamental to the experience and understanding of bodies in space (1977: 135-155) [For more on this see Bodies and Minds in Space page]. There is a physiological response to space and thresholds, whether it is given cultural emphasis or not. The thresholds and spaces can be subtle, made out of furniture, actions and conventions of behaviour, as well as architecture. The container schema works on different scales and so do the roles of Inhabitant, Visitor and Stranger. For a example, a Stranger is an Inhabitant when in the container called home, but a Visitor in the larger container of a city that does not include the home. What a society calls a stranger may actually have the role of a Visitor if they are not fully excluded. Karakayali (2006: 312) described the four domains in which strangers are used; circulation (of goods, money and information), arbitration, management of secret/sacred domains and ‘dirty jobs’. They are traders, guards, negotiators and interpreters; they have “halfway relations” (Karakayali 2006: 314). These are all characteristic of those on the threshold, involved with exclusion and transaction. They are Visitors. How these thresholds are manifest in the use of space or the architecture and used by the groups can be informative; what or who is or is not allowed across these thresholds reveals the groups confidence or fears of group contamination, the willingness to embrace the change that crossing or approaching these thresholds manifests, and how the powerful threshold is controlled. The threshold has a natural tension as our attention is drawn across it in fear and desire. How comfortable does one feel with crossing it; running towards, or running away? Are we happy to take risks beyond it, in the world, or not? Across this boundary influence can go either way. Cross boundary contact is both a danger and an opportunity/desire as Mary Douglas noted (1966) and Tuan (1986). The unknown of the realm of the Stranger being an unfamiliar world into which we can project our fears and desires, and the Visitor from that realm brings something of it back to us. Figure 2.The I-V-S Spatial Model compared with other models for threshold relations. The boundary between the Visitor and the Stranger (V-S) is more overtly a negative one as it is about controlling the degree of exclusion and contamination from the outside. It is also the point of reintegration as much as it is the point of separation [see Doorways to the Divine page], from here people, ideas and objects reach out into the world. With buildings such as visitor centres this current is very much in evidence. When the V-S boundary is weakened (for example in the glass front and wide open doors of the visitor centre) there is an intention to break down the group barriers by breaking down spatial barriers to enable Strangers to become Visitors. There is a confidence in the transformative effect of the interaction with the Inhabitants (the visitor centre staff) being in favour of the group (‘have a visitor guide to explore’, ‘come and join in the activities’, ‘become a member’). There is also confidence that the Inhabitants will not loose control of their space despite it being freely accessible and visible to Strangers. They are confident that their ideas and influence from within will reach outward in to the world towards the Strangers and with the newly converted Visitors. For these spaces with weak V-S boundaries, to coin a phrase, there are no Strangers only Visitors that haven’t been met yet. When the V-S boundary is stronger the increased exclusion indicates less confidence with contamination by ideas, actions or objects. For though all the religious groups I spoke to said they were happy to have visitors from other faiths, as the guidelines for Interfaith visits illustrate, they are admitted on special terms, with reduced visibility and presence, to minimise any disturbance to the faith group (Weller 2001: 71-77). There are also practical considerations. As I showed (in Irvine, Hanks and Weddle 2012) the reason to exclude Strangers in a liturgical ritual mode (Grimes 1982) context is to aid the practical functioning of these rituals that require a decrease in self awareness. Restricting the visual access of Strangers to the liturgical space, removes the effect of being watched by others not of your group, making one feel self conscious. 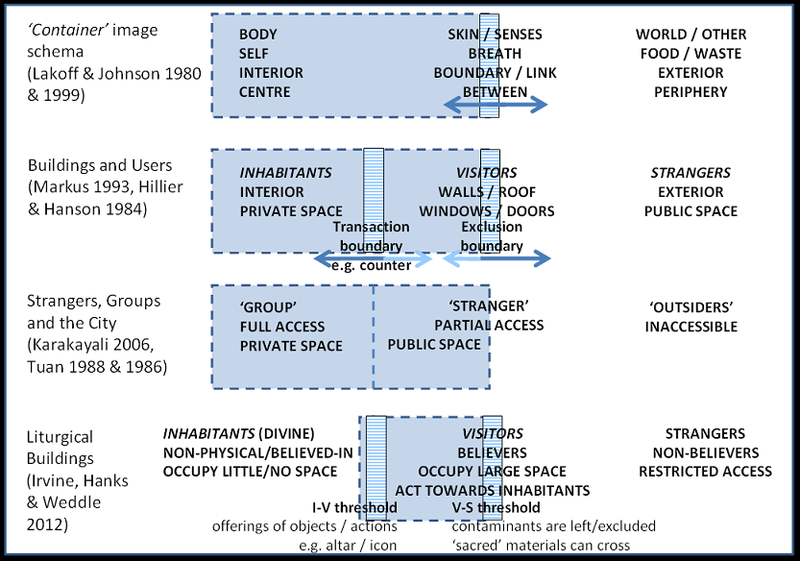 This boundary between Inhabitant and Visitor is principally about transaction as has been observed by Markus (1993) in his work on buildings. The transaction takes place via diverse media such as, objects, actions, words, sounds and scents. The threshold in a ritual context is often in the practical form of a table/altar, however transactions can also pass through an image, a statue or an invoked person. These all act as vessels for the divine to take part in the transactions. [For more on this see Minds and Bodies in Space page]. Scarry (1985: 314) classes all objects as either representational or as transactional. Scarry (1985: 286) also noted that our general relations to objects verges on the animate, and suggests, “Perhaps no one who attends closely to artefacts is wholly free of the suspicion that they are, though not animate, not quite inanimate.” The Inhabitants of the ritual space maybe non-corporeal (deities or spirits), but they are interacted with via the representational objects into which some of their presence is felt to reside. This embodying of the non-corporeal Inhabitant can be literal when the spirit/identity of the Inhabitant takes up temporary residence in the body of a Visitor. Thus blurring the boundary between Visitor and Inhabitant. The physical distance across the I-V threshold is an expression of the distance between those groups, as much as it is for the V-S threshold. But here there is an added pro-active power. Change can be sought, requested or brought about. This will depend on the mode (as defined by Grimes 1982) of the ritual. In some cases the distance across or towards the threshold is only an arms length with Visitors depositing objects, and thus there is the potential for blurring of the I-V boundary. Grimes reviewing the development of ritual theory (2000: 265) noted how that Victor Turner identified liminality with the sacred and secularity with social structure, with others reversing this equation. But here I hope I show that the liminal is a consequence of the social structure and can be seen expressed in sacred spaces and other spaces. 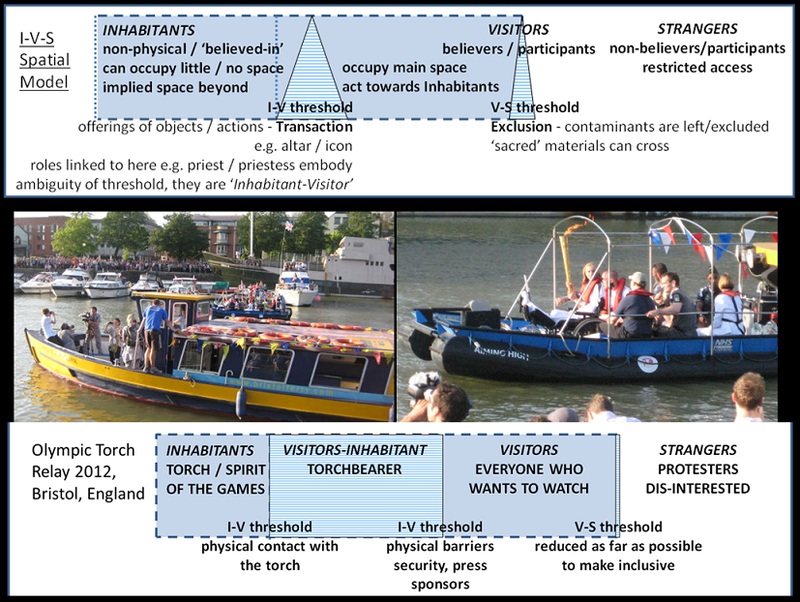 Visitors are like Turner’s communitas, a temporary community, but not as he would have it the “fountainhead and origin” of social structure (1967: 106). It emerges naturally from the container metaphor (Lakoff and Johnson 1980 and 1999), and the world being made of so many social/spatial containers that we move into and out of. Taking on the role of Visitor in different contexts, for more or less time, but becoming more important if in one context the Visitor role becomes heavily identified with. 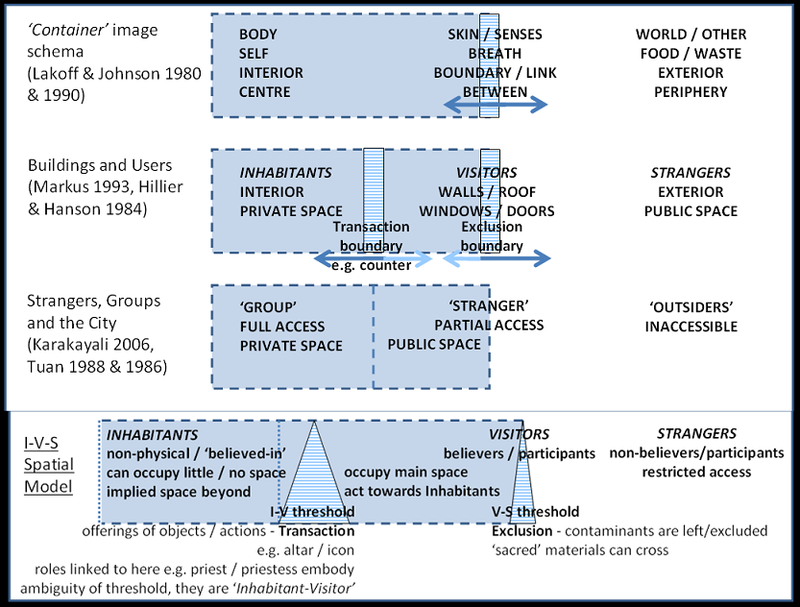 The liminal state of the Visitors does not necessarily result in change, unless the I-V boundary is crossed/used. As Grimes noted (2000: 266) rites can celebrate change that has occurred, or be acts of trying to protect from change, they conserve as often as they promote change. There may or may not be great change after passing through a ritual and approaching or using the I-V threshold, as Barker (1977) observed it is the way the thresholds are passed through by actors that can radically shift how a performance is perceived. For this relates to the fact that though the space, via mirror neurons, has a great effect on how we feel, it can be over ridden by our internal states. A one way threshold or rite that will leave you changed forever and which you can never cross again, has at the other end of the spectrum a threshold which we cross everyday without thinking much about, our own internal domestic doorways. Either side of each is different but one is given more notice or emphasis while the other is not, but we are somewhere different and there is an effect upon us even if it is only temporary and an unconscious effect. Crossing or being upon the I-V threshold of transaction can happen easily in some contexts. Imagine a tour guide leading a group into a museum. They walk together. The guide is probably at the front, but they are all united by the same physical activity of walking. They all face the same way. Once the exhibit has been approached the guide turns to face them. The guide now speaks for the exhibit and interprets for it. The guide can stand to one side and allow the tour party to have time to commune and interpret the exhibit themselves. Alternatively, the tour guide can stand in the way, supplanting the status of the exhibit, blocking the view and not allowing the tour party time for their own interaction with the exhibit. Those who use the I-V threshold can change the mode of a ritual. This threshold stands at the focusing point of the architecture and the attention of the Visitors. For example the Liturgical mode seen commonly in religious buildings is about “waiting upon power” and so not wielding it. However, once the I-V threshold is crossed rather than just approached, the power of the threshold as a place of change and transition can be wielded. The “wielding of power” is in the magical mode of ritual. Grimes’s modes (1984) describe the different moods, basic activities and motivation for each of these [see the Grimes diagram LINK]. So the shift from Liturgy to Magic would be ‘reverence/being/cosmic necessity’ shifting to ‘anxiety/causing/desire’ when the I-V threshold is crossed. 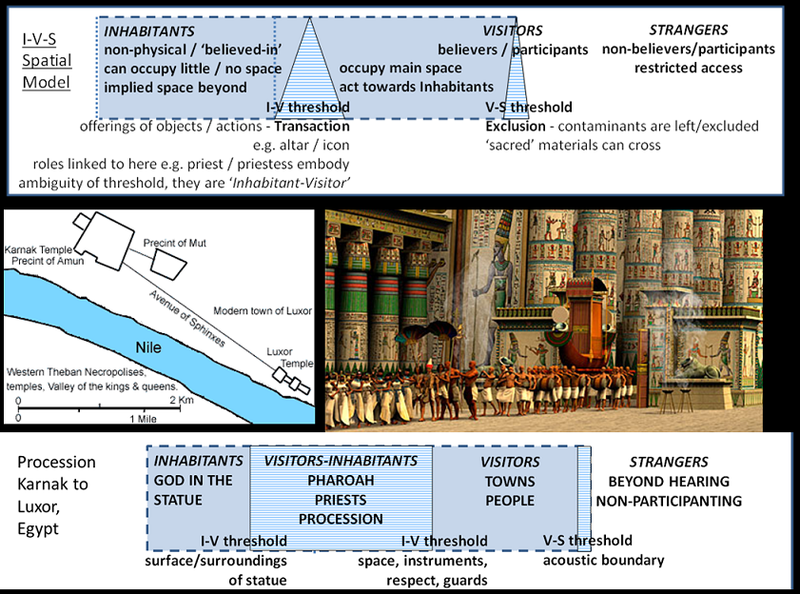 There can be more than one of either the I-V or V-S thresholds with layers of complex social structures, with degrees of Visitor-ness and Inhabitant-ness (see the Temple of Amun example later page). But as stated earlier this is part of the variability of context, so a Priest is an Inhabitant of the Temple into which the lay people of Egypt cannot go so they could be called Strangers. However the God of the Temple is more of an Inhabitant than the priests. And when the image of the God is processed outside the Temple the people of the city become auditory Visitors. The mode has now shifted from the Magical and Liturgical ritual of the interior of the temple to the exterior processional way in the Ceremonial ritual mode. In this example the thresholds are created by very little physical structure, but they still work. A series of natural boulders bearing rock art are scattered along the slopes of the mountain Ben Lawers above Loch Tay and were studied by Richard Bradley and Aaron Watson (2012: 64-78). Each sits within a slight hollow in the hill slope which is too fine to appear on the contours mapped for the hillside, but which does create relative shelter from the wind. The view is lost if the observer moves 20 metres in any direction from this site. More importantly this hollow restricts visual access from the rest of the hillside. This creates the outer V-S boundary while maintaining more distant views of the peak of Ben Lawers and the waters of Loch Tay. Also the visual access is restricted in another way. The boulders covered with the rock art were ‘hidden in plain sight’. For despite the boulders having carvings on them and an area of bare earth (from the archaeological excavation) surrounding them the team had difficulty everyday with locating the boulder in question from the others scattered across the wide mountain side. At Ben Lawers the other transactional I-V threshold is that of the surface of the stone itself on to which the rock art is carved. Just like an altar or iconostasis this is the transaction threshold, as illustrated by the archaeological artefacts left here, but not around other similar non-decorated boulders nearby (Bradley and Watson 2012: 64-78). Rock art that occurs in Irish and British passage graves has been shown (Robin 2012: 79-88) to have a distinctive positional relations, with distinctive abstract motifs at the thresholds of the main passage way or the final chamber, or sometimes both. As Jones (2012: 87) says, the act of carving and the observation of the changing of the carvings in the light is part of forming a relationship, “Carving rocks is less about signalling identity and defining territory, and more about establishing relationships with different places.” Some describe the concentric rings as tunnels. Others have suggested that the concentric rings motif that has a line running towards the centre is a perspective effect implying movement inward and therefore an entrance, and that when these rings appear in actual entrances, at passage graves, the line is not present as it is unnecessary. This rock art example of a I-V boundary is both near, close enough to touch, and very far away as the interior of the rock is visibly inaccessible, another world. Conversely from this ritual space other things are visibly accessible (sky, mountain and the lake) but too far away too touch. To some extent the projection of the ‘container’ on to the implied space beyond the I-V boundary of the rock’s surface falls upon the other inaccessible places that are also ‘beyond’. 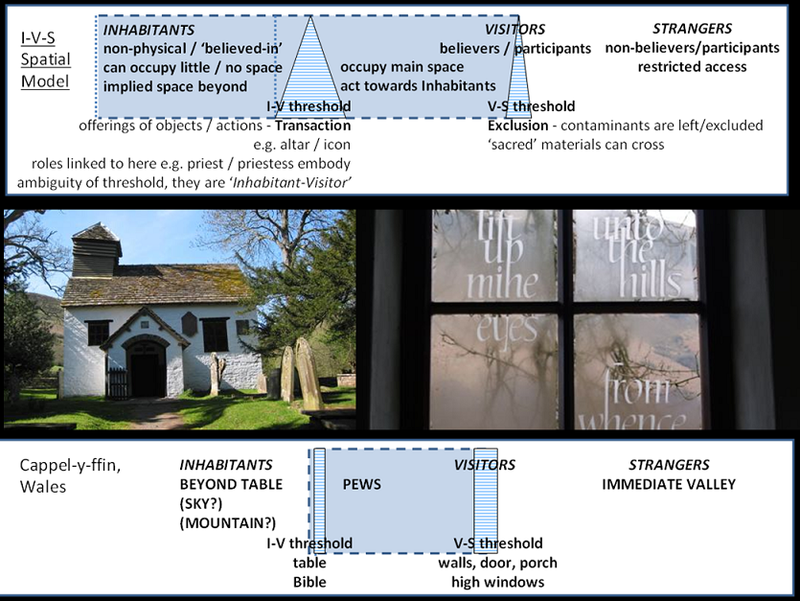 With the liturgical buildings I studied [see Doorways to the Divine page], though there is visual access to sky and in some cases the hills, the middle distance from where Strangers would be near enough to see what was occurring inside the ritual space, is restricted. The near distance being within the space for the Visitors is visible to be useful so that they can co-ordinate and synchronise group actions which is important for the ritual process (Hillier and Hanson 1984: 191, Marshall 2002: 360). An interesting example of incorporating the distant view of the hills is the little chapel in Capel-y-ffin, Powys. This chapel is so surrounded by hills, that the views of the sky from the interior are largely blocked, and so in the chapels recent restoration the Bible quote “I will lift up mine eyes unto the hills from whence cometh my help” was etched on to the glass and is visible against the dark hill, but not the bright sky. The table-altar is not the only part of the I-V threshold here, but so is the Bible on the lecture. It has many of the qualities of the icon. Flood (2009: 25-57) explores the idea that religious reading has distinct qualities from ordinary reading. “The process of religious reading itself occurs in a borderland between text and world and between self and world.” (Flood 2009: 26) Flood shows how reading is an embodied activity in a number of ways such as; the reader is re-enacting the reading of the text that was done by those in the past of the tradition, the reader is also sharing physical activity; “gestures, postures and expressions” (Flood 2012: 52) with others in the community but most fundamentally the voice of the reader becomes the voice of the text. This brings the reader across the I-V boundary to some association with the Inhabitant as interpreter/speaker/author of the text. Religious reading in the Christian monastic tradition is called ‘lectio divine’ in which you deliberately read slowly as if the text is speaking directly to you. God is speaking directly to you and within you. In this next example sound is used to extend the V-S threshold of a ritual beyond the temples and the procession between the two via an avenue of sphinxes out across a city which is now covered by the modern city. Meyer-Dietrich (2010) describes how the people of the city of Thebes in the Middle Kingdom period were normally excluded from involvement in the rituals that occurred in the temples, thus making them Strangers in that context. However, when the statue of the god (Inhabitant) came out of the temple and is processed through the city towards Luxor, many could have seen the procession but many more would have only been able to hear it. The hearing of the sound of the procession draws the listeners into the space defined by the sound. The ‘Container’ image schema means that sound is treated like other substances such as water or rain, for though the boundaries are very defuse we treat it as a space, something we are in. Sound is a means to extend the body in to the world, and a group can make more noise and extend itself even further. Meyer-Dietrich also points out that sound is able to cross boundaries and unite the diverse spaces of the city; many normally regarded as profane. But the effect only lasts for as long as the sound lasts, and moves when the source moves. The acoustically defined space visiting ‘Visitor’ status on to the people, so to speak. The source of the sound becomes the natural centre of the space, and the edge where the sound can no longer be heard. And sound is, of course, a frequently used method to synchronise behaviour during ritual practice. This procession is a sign of confidence or challenge in the Grimes ritual mode of Ceremony. There is no fear of contamination when the ritual participants are the largest sound around. The effect of any Strangers who are not of the same belief as the Visitors is minimised as they are invisible acoustically. Even when one is within the sound container one can still feel excluded by differences of interpretation or meaning of the sound of the ritual. Not understanding the language or not identifying with it or perceiving it as threatening would lead to feeling excluded even when within ear shot. The root of this feeling may lie in the primate behaviour of group chorusing during evening assemblage, a behaviour both bonding for the group and a warning to other groups. The Olympic Torch Relay of 2012 that I observed seemed to me to switch between the Celebratory and Ceremonial modes as defined by Grimes (1982). The flame, the symbolic spirit of the games, was lit in Greece and has been on a long journey before heading to the opening ceremony at the games. It is carried by hundreds of people in a relay around the country that tried to cover as many places as possible, pausing on route for various welcome ceremonies and entertainment events. On 22 May 2012 it came to my home town of Bristol and the runner carrying the flame, changed to a wheel chair user in a boat for a section through the Floating Harbour of Bristol. This meant that the large number of sponsorship floats and teams that preceded the flame were absent on this section. So here you had the torchbearer, with a small group of supporters, security and boat crew. then a couple of press boats and large crowds on the quayside. At the point where I was standing the press boat blocks the view as the torchbearer’s boat pauses as it needs to time its arrival at the city centre for a much larger part of the event. The crowd had been sitting about enjoying the sunshine, curious about the event, and not really sure what to do other than wave and clap a bit. And this is where the press encourage us to fake enthusiasm for the cameras official record of the event. At this event the V-S boundary is minimised to make the event as inclusive as possible, as does sharing the role of torchbearer among many people and having a route across much of the country. However, of course, not everyone is on the route, and not just anyone can carry the flame. The I-V boundary is more complicated here. There is still security to act if necessary to remove protesters from contaminating the event and bringing in discordant activity, but this is discrete. The sponsors floats were tasked with whipping up the crowd into the ‘right’ behaviour for the event. In their absence during the Floating Harbour section the public were not so enthusiastic as they were elsewhere. The press, sponsors and security produce an obvious barrier all along the route, but here the water adds an additional physical restriction. However, the press are also the link to letting all Strangers become virtual Visitors to the event via broadcast media, but only after the event itself and in an edited version. The Torch/Spirit of the Games is definitely an Inhabitant of the space. The role of Torchbearer is obviously extremely close to it but as the role is diluted through so many pairs of hands no individual becomes too closely identified with the torch to threaten its authority as principal inhabitant. For the last forty years the “Ragged Heroes Mummers” have been performing the mumming play on the night of Christmas Eve in the village of Lacock in Wiltshire, and I have joined them for most of the last ten years. This was a revival of a village tradition that had lapsed in the early 20th century. The play is performed in ragged disguises in a series of public houses around the village and a neighbouring hamlet. A procession between each pub is welcomed by people waving and shouting greetings from houses as they pass. The pubs are crowded with local people who are often having an evening singing Christmas carols. Taking photographs is difficult due to how crowded these pubs get. Performers and Mummers rub shoulders and the ‘slain’ characters who are later restored to life, have very little floor space in which to fight and fall. A curious inversion of the context for this play has occurred compared to how it was performed before the revival. The performers of the play, the mummers, are sometimes referred to as ‘guisers’ for their costumes are there as disguises to hide their identity as originally the plays were performed by locals, pretending to be ‘strangers’ to allow them license to break with social norms. Now all of the performers are actual strangers to the village, none of them live in the village and few villagers know who any of them actually are. So they are now more stranger than the earlier mummers. However, the mummers in this context are the ‘Visitors’. We burst in, do the play, have a drink and then leave. The Strangers are the excluded general public who normally fill this village all year round as the village is so picturesque it has appeared in countless films and television series. The village has entertained the public all year long. On this evening it is a select few of those from outside of the village, the mummers, who now entertain them with a village tradition. The timing of the event on Christmas Eve and the lack of any advertising outside of one or two posters in the pubs, means there is almost no one in the pubs who is not a local resident; hence forming the V-S boundary. 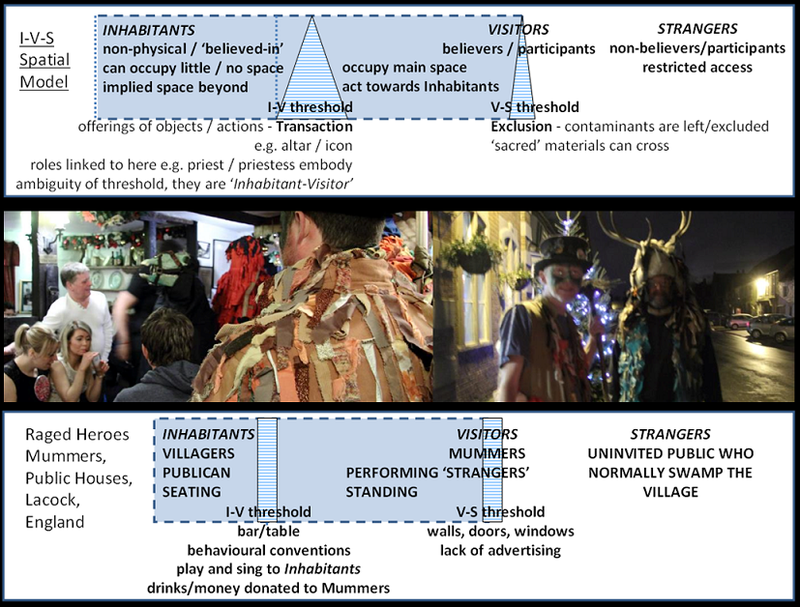 The transactions across the bar and pub tables that form the I-V boundaries involve the mummers offering the play, looking silly in the costumes and singing. In return the mummers are given drinks and a little money. The main point of interaction which steps a little over the conventional boundary of performance is a female audience member being surprised (some how there is always seems to be one who doesn’t know what happens) and acting as the ‘maiden’ to kiss the ‘slain’ characters to revive them to life. ‘To make these stiff things stand’ as the text of the play puts it. 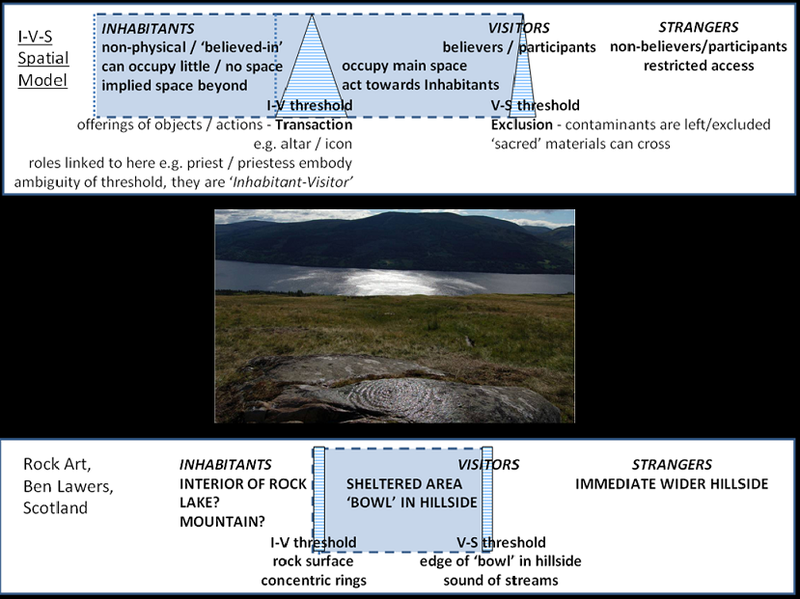 I hope that in this review of a wide variety of examples I have shown how the Inhabitant-Visitor-Stranger Spatial Model is a useful flexible approach to understand ritual spaces and the dynamics of the group relations expressed through them. With further research and reading I hope to see if a pattern emerges like that which I have found for liturgical ritual spaces (Irvine, Hanks and Weddle 2012) for the other modes of ritual. Barker, Clive. 1977. Theatre Games. A New Approach to Drama Training. Methuen. London. Bradley, Richard. and Watson, Aaron. 2012. ‘Ben Lawers: carved rocks on a loud mountain’ pp64-78 in Cochrane, Andrew; Jones, Andrew Meirion “Visualising the Neolithic: abstraction, figuration, performance, representation.” Neolithic Studies Group Seminar Papers 13. Oxbow. Oxford. Flood, Gavin 2009 ‘Dwelling on the Borders: Self, Text and World’ pp25-57 in Thurfjell, David and Jackson, Peter (eds) “Religion on the borders: New challenges in the academic study of religion” Södertörn Studies on Religion 1. Södertörn University: Stockholm 2009. Lakoff, George and Johnson, Mark. 1980. Metaphors We Live By. The University of Chicago Chicago. Grimes, Ronald L. 2000 ‘Ritual’. Braun, Willi., and McCutcheon, Russell T. 2009 (2000) (eds.) Guide to the Study of Ritual. London. Jones, Andrew Meirion. 2012. ‘Living Rocks: animacy, performance and the rock art of the Kilmartin region, Argyll, Scotland.’ pp79-88 in Cochrane, Andrew; Jones, Andrew Meirion “Visualising the Neolithic: abstraction, figuration, performance, representation.” Neolithic Studies Group Seminar Papers 13. Oxbow. Oxford. Karakayali, Nedim. 2006 ‘The Uses of the Stranger: Circulation, Arbitration, Secrecy, and Dirt’ pp312-330. Sociological Theory. 24. No.4. December 2006. American Sociological Association. Knott, Kim. 2009. ‘Inside, Outside and the Space in-between: Territories and Boundaries in the Study of Religion’ pp69-102 in Thurfjell, David and Jackson, Peter (eds) 2009 Religion on the borders: New challenges in the academic study of religion. Södertörn Studies on Religion 1. Södertörn University. Stockholm. Markus, Thomas A. 1993. Buildings & Power: Freedom and Control in the Origin of Modern Building Routledge. London. New York. Robin, Guillaume. 2012. ‘The figurative part of an abstract Neolithic iconography: hypotheses and directions of research in Irish and British passage tomb art.” pp140-160 in Cochrane, Andrew; Jones, Andrew Meirion “Visualising the Neolithic: abstraction, figuration, performance, representation.” Neolithic Studies Group Seminar Papers 13. Oxbow. Oxford. Scarry, Elaine. 1985. The Body in Pain: The Making and Unmaking of the World. Oxford University Oxford. Tuan, Yi-Fu. 1986. ‘Strangers and Strangeness’ pp.10-19 in Geographical Vol.76. No.1. Jan. 1986. American Geographical Society. Tuan, Yi-Fu. 1988. ‘The City as a Moral Universe’ pp.316-324 in Geographical Vol.78. No.3. Jul. 1988. American Geographical Society. De Waal, Esther. 2011 (2001). Living on the Border. Reflections on the Experience of Threshold. Canterbury Norwich. Weller, Paul (ed.). 2001. Religions in the UK Directory 2001-03. The Multi-Faith Centre at the University of Derby & the Inter Faith Network for the United Kingdom. Derby & London.